Questions about Payment Gateways for dropshipping stores are some of the most prevalent for FlyingStartOnline. We figured we’d better formerly address this sooner, rather than later. 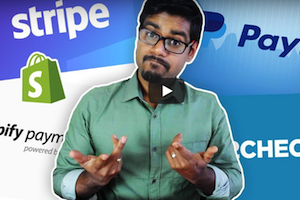 So what is a payment gateway? It’s something that connects your store to your bank account. When a customer visits your Shopify Store, and adds a product to their cart, they need to complete the checkout by paying. The payment gateway integrated into your store is how people securely transfer money from their account to yours. There are many different payment gateway options available. Payment gateways allow customers to enter their payment details without leaving your website. Once a customer has completed their checkout, your payment Gateway transfers the money to your bank account. Then why are so many people confused when it comes to Payment Gateways? Well, depending on your citizenship and nationality, the options for payment gateways are borderline overwhelming. But after our own tests, and literally hundreds of conversations with fellow dropshippers, we’ve come to some conclusions. There are a handful of payment gateways that resonate with the majority of dropshippers we’ve spoken with. Stripe is used heavily with dropshipping stores because they offer direct integration. This means customers never leave your website during the checkout process. People can pay for goods, using their credit cards, in a matter of seconds. They also offer superb customer service, tech support and instant transfers. Stripe is definitely the gold standard when it comes to online payment processing. Being that Stripe is setting the standard for seamless payment processing, it’s no wonder they’ve partnered with Shopify. Shopify Payments are now automatically powered by Stripe. You can still use other gateways like PayPal if you’d like, or if Stripe isn’t available in your country. However, if Stripe is available in your country, you can begin processing credit card payments as soon as your account is approved. If you decide to use PayPal, we suggest opening a PayPal Business account. Once you do this and integrate with Shopify, enable PayPal Express Checkout. This is a popular option because customers don’t need their own PayPal account. They can also checkout using their debit or credit card. 70% of CommonPanda sales are processed with PayPal. Many large stores still exclusively use PayPal simply because people are accustomed to seeing it. But PayPal is not without headaches (freezing funds, siding with scammers in disputes, and randomly placing accounts in a review state) which is why you see other options on this list. 2Checkout, may be the next best option for you. 2Checkout is supported in many of the countries where you don’t find Stripe or PayPal. That said, there are some less than ideal aspects of conducting business with 2Checkout. For instance, they manually review your transactions and have been known to call customers at random. This is annoying to your customers, and also gives the impression that you and your business are shady. This is more of a last resort and likely to result in lowered conversions. All that said, lowered conversions are still better than no conversions. P.P.S. Click here for Episode 23!